I would not buy one! 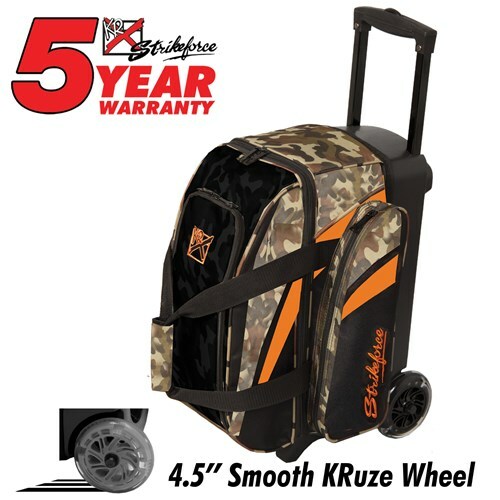 First problem with this bag is the narrow stance of the wheels, very unstable. The second problem is the handle. After only having this bag for 3 months the handle became very sticky and would not slide up and down without a lot of force. The third problem and probably the worst part of this bag is the CHEEP zippers. after only 4 months of owning this bag the main zipper broke and now the bag is unusable. Does this bag have room for two balls? Yes, it will for this is a double roller. My husband wears a size 17 shoe,will they fit? Due to the time it takes to produce the KR Strikeforce Cruiser Smooth Double Roller Camo ball it will ship in immediately. We cannot ship this ball outside the United States.